"If I'm acting under the weather, take me to the vet immediately, please." Bringing a pet into your home is simultaneously a wonderful privilege and major commitment -- one that lasts for years. If you're considering welcoming a pet ferret into your home, some knowledge on the wee creatures may be helpful, whether it pertains to life expectancy or their daily dietary needs. The life expectancy of any individual animal isn't always easy to predict. Many factors are relevant to the lifespans of ferrets, including genetics, lifestyle and living environments. The diurnal mammals, on average, however, tend to live for anywhere between 6 and 10 years. Despite that, some ferrets may unfortunately pass away before they reach their sixth birthdays, while others may make it past the 10-year point. As a ferret owner, it is vital to make an effort to ensure that your pet lives as long, healthy and happy a life as possible. Feed him a balanced and proper carnivorous ferret diet. Look for a commercial dry ferret food that consists of the right levels of all of the nutritional elements that these guys need to stay strong and energetic, including protein, taurine and fat. Consult with a veterinarian regarding suitable ferret foods available to you at stores. Outside of food, it is crucial to always make sure that a ferret has ample clean and fresh H20 in his immediate living environment. Veterinary attention also can have a great effect on a pet ferret's lifespan. Routine checkups are a must. It is important to schedule veterinary appointments for ferrets at least once a year. This way if your pet has a health problem, your veterinarian can get on track to managing it -- and hopefully eliminating it -- quickly and efficiently. 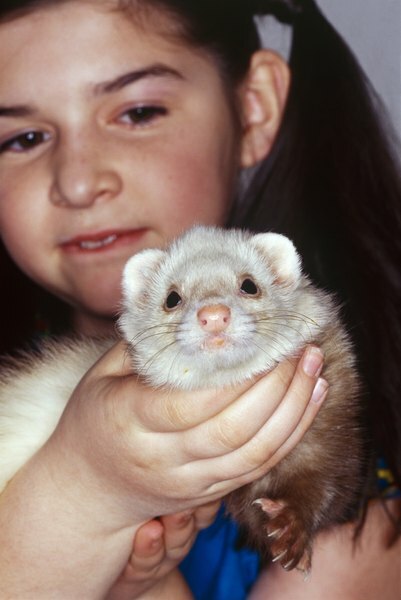 Ferrets typically have longer life expectancies than many other small pets. Rats, for instance, generally stay alive for between 2 and 3 years. Pet hamsters have even briefer life expectancies than rats -- in the range of 1 and 2 years. Chinchillas, similarly to ferrets, can live for a maximum of around 10 years. Ferrets have much shorter life expectancies than larger domestic animals such as dogs and cats, however. What Is the Expected Life Span of a Blue-Point Siamese Cat?